As Saké popularity spreads around the world, the secrets behind its ancient traditions have come to light. Thanks to Kristy Puchko for help with this week’s saké education. Saké has more in common with beer than wine. Though English-speaking countries often refer to saké as "rice wine," that's a misnomer. Rice wine is made from the fermentation of rice, while Western wines are made of the fermentation of grapes. Saké is made from rice through a brewing process that converts starch to alcohol, similar to the way that beer is made. Brewing saké is an arduous process. That would be the understatement of the year. Saké rice is first stripped of protein and oils in "polishing," then washed of its debris and air-dried. After being steamed, Koji is kneaded into the rice by hand or by machines. Koji is a mold that will help convert rice starch to sugar, which will turn into alcohol during a two-step fermentation process. This second fermentation stage lasts 25 to 30 days, depending on the type of saké being made. During this time the brewers will keep a close watch on the batch day and night, adjusting temperature and ingredients as needed. Finally, in the Jo-So stage, the rice mash is pressed. The resulting saké is bottled. Brewing saké can be a communal process. The 144-year-old Yoshida Brewery in Northern Japan, still uses people over mechanization for several of the steps. To accomplish this, their workers spend half the year (October through mid-April) living onsite to oversee the saké's creation around the clock. That’s some dedication to making a product! Their official title in Japan is "Tōji." A brewery's Tōji is not only responsible for the taste of the brew, but also for keeping his or her team in harmony during the long winter months of work and communal living. The Tōji is a parental figure to his or her team, and will eventually mentor the next potential Tōji in an apprenticeship that can take decades. Skills of saké-making are passed down through hands-on-training instead of through schools. More polishing means higher-grade saké. Saké designations like Futsu, Honjozo, Tokubetsu, Ginjo, and Daiginjo are determined by how much of the rice grain was polished away in processing. The lowest grade has 30 percent, or less of its grain polished off, while the highest grade (Daiginj) has 50 percent polished away. If any of the above is paired with "Junmai" (which translates to "pure rice"), it means that bottle of sake had no distilled alcohol added to its mash. It's purely rice-made alcohol. Saké has a higher alcohol content than either beer or wine. The alcohol content of beer is typically between 3 and 9 percent, while wine is between 9 and 16 percent. Saké can be upwards of 18 to 20 percent. Hard liquors have the highest with 24 to 40 percent. It's the oldest known spirit in the world. Some say the origins of saké date back to 4800 BC China. 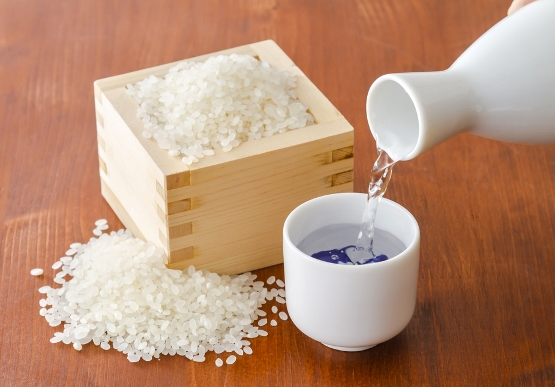 It wasn't until 300 BC that saké came to Japan with wet rice cultivation. While sake origins are old; diatoms that make up diatomaceous earth filter aid are 12 million years old. They’re meant for each other! Now a male-dominated industry, saké-making was once considered women's work. The origin of the word "Tōji" roughly translates to "independent woman,” and original tojis were the saké brewmasters. Housewives were also called the "toji of the house." First, mold, now this: Spit used to be a key ingredient. Today Koji fungus is used to ferment the rice. But long ago villagers would gather together to chew on the polished rice and then spit its mashed remains into a communal tub. The enzymes of their saliva aided fermentation. I’m really glad they’re not doing this anymore. What else is important about sake? Saké can be served cold, room temperature, or hot. It depends on what you’re eating, and the time of year. It's also rude to pour your own glass of saké. It’s meant to be an act of bonding or friendship, so let your loved pour for you. Saké is a complicated product to make! That amount of skill to make it, and the time and energy shouldn’t be all for naught by using a lesser grade diatomaceous earth filter aid. With all that commitment to taste, clarity, quality, and consistency, saké producers want the highest purity filter media: PurifiDE DE filter aid. Their goal is to minimize the impact of extractable elements on that high quality saké. EP Minerals’ PurifiDE XG-3 and XG-12, our purest diatomaceous earth filter media, are made from unique DE ores which are mined, calcined and further purified by using proprietary processes to reduce impurities to trace levels. PurifiDE XG is guaranteed to meet or exceed United States Pharmacopeia standards for purified siliceous earth. Extractables specifications for PurifiDE XG diatomaceous earth filter aid are less than 1 ppm arsenic or lead, and less than 10 ppm of iron. Perfect and worthy to filter sake. I’ve got a whole new appreciation for sake now. It certainly deserves the highest quality and highest purity diatomaceous earth filter aid!